Dererk Pardon dunks the ball. The senior center scored 20 points against Michigan in NU’s last game. 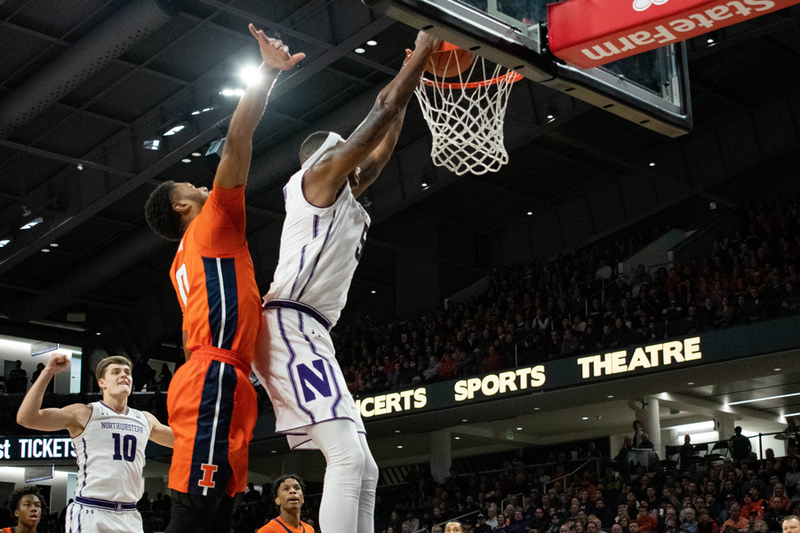 After six games of conference play, it is pretty safe to say that Northwestern has not gotten off to the start it wanted when the season began. Aside from a two-point victory at home against Illinois, the Wildcats (10-7, 1-5 Big Ten) have struggled to keep up with the much-improved Big Ten. It seems that NU has found every way to lose: close games against Indiana and Michigan, two road blowouts against Michigan and Michigan State and a close battle against Iowa that the Wildcats let slip away late. Fortunately for NU, it will have an opportunity to get back in the win column against Rutgers. Like the Wildcats, the Scarlet Knights (8-8, 1-5) are tied for 11th in the conference with a 1-5 record. Rutgers’ lone win came at home against Ohio State, but, since that game, the Scarlet Knights have gone back to their losing ways. In its two most recent games, Rutgers lost by 18 to Minnesota and 35 to Purdue. The Scarlet Knights rely on their leading scorer, Eugene Omoruyi, who is averaging 14.6 points per game. With both teams desperate for their second Big Ten win of the season, it is sure to be a tightly-contested matchup. When NU and Rutgers faced off in Piscataway last year, the Wildcats lost in an overtime thriller 67-58. This time around, NU will look to produce a different result after having five days of rest. The break could help determine senior forward Vic Law’s status for Friday’s game. Law missed the Wildcats’ last game against the Wolverines with a lower-body injury and had struggled from the field in the previous three games. The senior from South Holland, Ill. has undoubtedly been Mr. Reliable for NU all season. As the team’s leading scorer, his experience would be a big boost for a team needing a win. In the last four games, the Cats’ offense has scored 61.5 points per game, nine points below their season average. Despite the struggles offensively, graduate guard Ryan Taylor has been a bright spot in NU’s offense. The 5th-year guard has picked up the slack for the team, shooting .500 from behind the arc in his two of his last three games and scoring in double-digits in five of the last six games. Taylor will have to take more 3-pointers to win against the Scarlet Knights. In contrast, the Wildcats are shooting 27.2 percent from deep in the last four games and are shooting 33 percent for the season. NU will look to have more success from the outside or else they will have to look to the paint to score more points. Senior center Dererk Pardon scored 20 points last game against No. 2 Michigan and the Wildcats could look for him to have more of a role offensively. Last year in the matchup, Pardon scored 12 points on 6-for-7 shooting. With some more consistent outside shooting and a more concerted effort on attacking the rim, NU could come out of Rutgers with a victory.